So today I’ve got something new and different for you. Isn’t that exciting? I have recently been delivered the UK’s first Gas three-in-one barbecue. 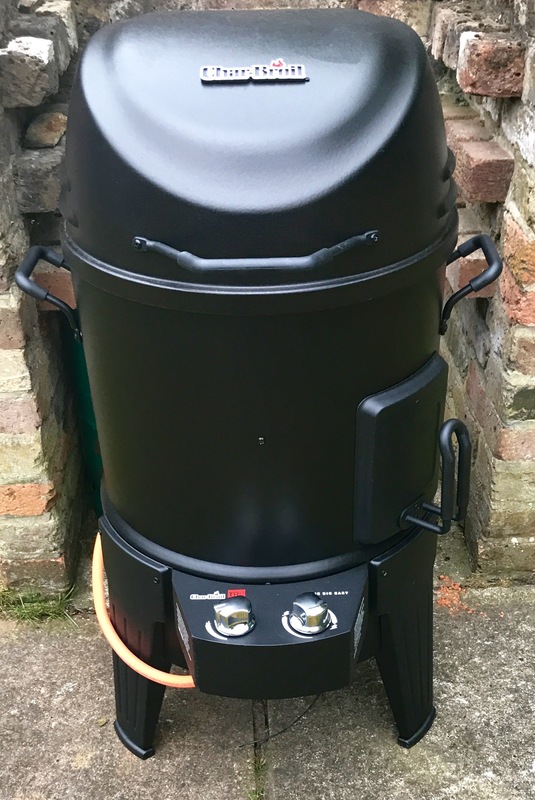 It’s called the Char-Broil Big Easy and it’s a neat grill (barbecue), smoker and roaster with a stylish somewhat sci-fi look to it. It’s now occupying pride of place in my garden and over the next few months I’m going to be telling you all about it and publishing recipe ideas for this wonderful addition to my cooking alternatives. And you all know how much I love cooking outdoors – must be in my blood. Okay, so here’s the low down. First up is the roasting option – and with the capacity to cook up to 11kgs of meat and vegetables in the basket insert you’ve got those large family gatherings covered. There’s also a special way to cook spare ribs by hanging them on four integrated stainless steel hooks – but more of that later. For hot smoking, the Big Easy has a pull-out box to fill with wood chips of your choice – and who knew how many different types there were. I’ve ordered a selection in anticipation of some serious smoking coming up. Finally, if all you’re after is a quiet barbecue, the Big Easy has a handy grill that fits to the top. Today I decided to start with the simplest of tasks. My love of rotisserie chickens and my consumption of them (particularly in Spain) is widely known. 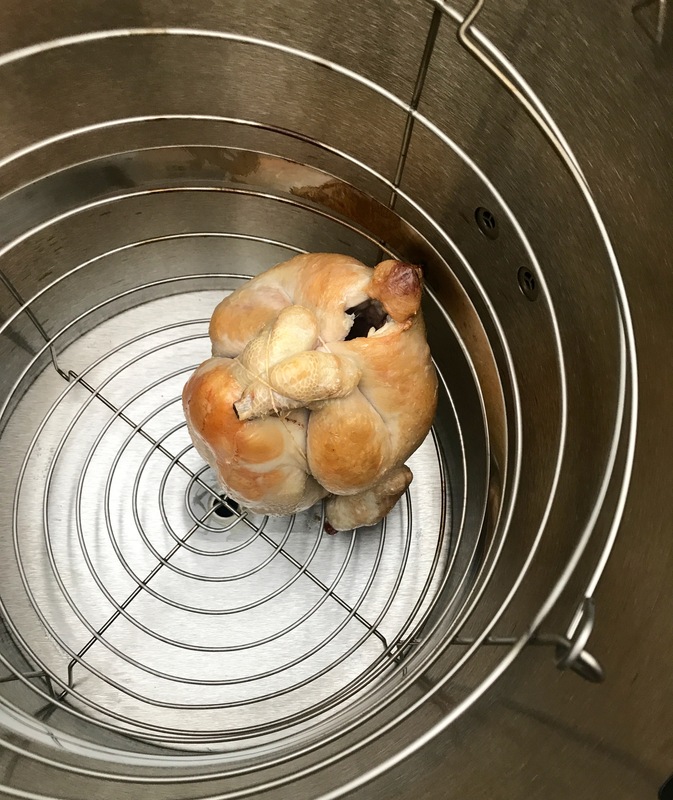 And I had the thought that cooking a chicken in the Big Easy’s roasting basket would be a very similar process. So, keeping it simple like I said, I rubbed my chicken thoroughly all over with a little olive oil and propped it up in the basket. At 15 mins per 450g it was ready 35 minutes later. And perfectly ready! 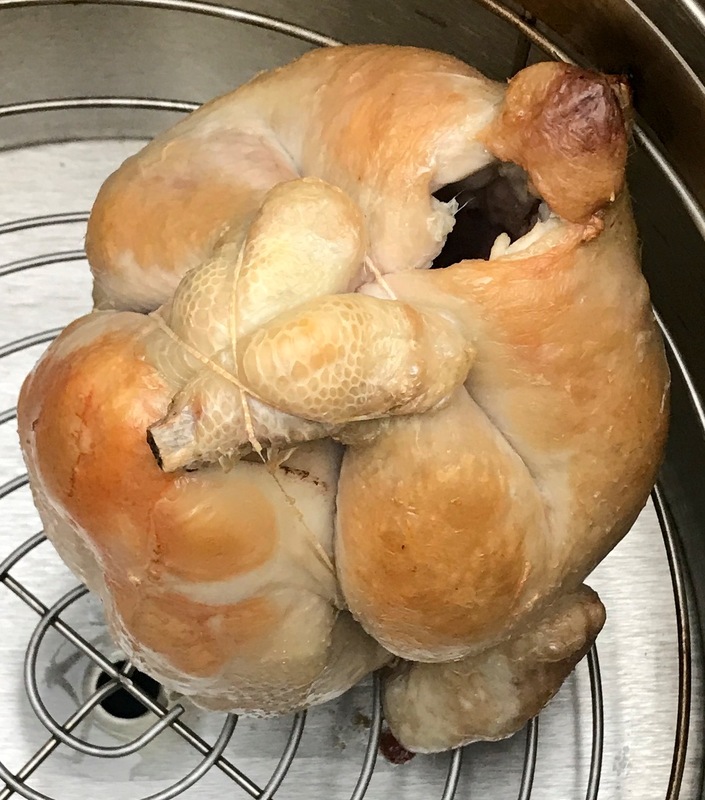 The aromas as I lifted the lid washed over me and transported me back to those rotisserie sellers in my favourite Spanish markets. You can see from this picture how large the basket is. Having said that, it roasted with my smaller chicken (big enough for 4-5 people) perfectly. It’s also a really healthy way of cooking as your chicken isn’t sitting in any oil though it still comes out with lovely crispy skin. Be adventurous and add international flavours to your chicken but making a butter or olive oil rub. Add fresh ingredients to butter, blend together and smear under the skin of your chicken or mix ground ingredients with olive oil and rub over thoroughly. Here are some ideas to get started. Blend dried cinnamon, cumin, saffron strands and fresh mint with butter. Mix ground cardamom, cloves, coriander and curry powder with oil oil. Watch this space for plenty more ideas on cooking with the fabulous Big Eas. Up next I’m going to be smoking salmon – with some very special ingredients. Find out more about the Big Easy and Char-Broil’s other products by clicking here. Haha, wish I could ship you one for a birthday present. I’m having another go at the smoked salmon tonight. Plum, apple or cherry wood is my decision? ?